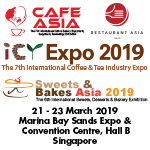 As the only trade and consumer exhibitions in Southeast Asia catering to the café, coffee and tea communities, Café Asia & ICT Industry Expo will bring together café owners and managers, coffee and tea exporters and importers as well as distributors and suppliers of café-related machinery and equipment in a dynamic marketplace. The two expositions are held concurrently to offer the ideal one-stop convenient hub for professionals to source for supplies and explore business opportunities with both regional and international counterparts. They are the most dedicated events on the region’s café, coffee and tea industries in Singapore.